Following investor meetings and property visits with management earlier this week, we believe the simplicity of Brixmore Property Group’s (BRX) story/strategy will continue to gain traction as the perceived Blackstone Group (BX) overhang diminishes and the company continues to deliver sector leading net operating income (NOI) growth. Our time with management and field personnel emphasized that there is truly a special camaraderie that exists within BRX … It seems that BRX is taking over its own destiny as it steadily gains independence from BX under the leadership of CEO Mike Carroll (started in 1992 out of college). We maintain a Buy rating. We made BRX our Top Idea for 2015 as management continues to roll out its portfolio upgrade program, which drives sector-leading NOI growth, while its discounted valuation and laggard performance in 2014 should attract attention following the strong performance of many REITs last year. The continued unwind of BX’s recap equity position acts as an additional catalyst and increases the independence of the company. BX currently owns 50.4% (49.3% voting stake) vs. 78.8% at BRX’s IPO and… [a]ssuming additional offerings in 2015, we estimate BX will be below 30% ownership stake by yearend. On the portfolio side, management has been increasingly vocal about its Raising the Bar initiative, whereby it is improving the curb appeal of its centers and simultaneously upgrading the tenancy while boosting occupancy (BRX Q3 leased rate was 92.7% vs. a peer average of 95.0%). Thus, BRX gets a double benefit of higher rents and occupancy, which shows up in its strong NOI growth of 3.8% through Q3’14 vs. shopping center peer average of 3.6%. Finally, the debut investment grade ratings, which management looks to improve, mean that BRX can now tap the unsecured debt markets … and lower its cost of capital. BRX reported in-line results and issued 2015 guidance whose midpoint is slightly below our estimate and consensus. Reported Q4’14 funds from operations (FFO) per share of $0.43 included a $0.01 charge associated with secondary offering expenses. Our $0.44 FFO/per share estimate did not include this estimate, nor do we believe the consensus estimate ($0.44) did, either. BRX’s underlying fundamentals remained solid as seen in year-over-year small shop occupancy gains of 100-plus basis points…, 13.9% blended leasing spreads (in line with Q3’14), and same-store NOI growth of 3.9% (in line with Q3’14). Our initial take is we view BRX’s overall results as consistent with previously stated objectives, including reducing the Blackstone overhang and repositioning anchors vis-à-vis its Raising the Bar initiative. Year to date, BRX is up 5.9% [in occupancy gains], 80 basis points ahead of shopping centers (5.1%) … While the conservative guidance may be viewed negatively, we would recommend buying on any weakness. Further, we also view BRX’s valuation as attractive. While it trades at a 7% discount on a forward price/cash available for distribution (or P/CAD) multiple, its five year growth rate of 13.1% well-exceeds its peers’ 7.5%. General Growth Properties’ (GGP) high- productivity portfolio is well positioned to generate strong growth in 2015 and beyond, as the REIT takes advantage of the favorable supply/demand environment to push rents and re-tenant underperforming retailers. Same-store sales growth of 4.8% (likely lower ex-Apple) in Q4 was a positive in an overall strong quarter, in our view, given the relatively weak sales growth over the last year. GGP’s high quality, urban street retail portfolio is a differentiator among the mall REITs, in our view, and a positive for GGP as it is a natural extension of its mall portfolio, in our view. GGP increased its dividend 6.3% in Q4, reflecting the strong fundamental outlook for the portfolio. We are maintaining our Buy rating and increasing our target price to $33, a 10% premium to our $30 net asset value (NAV) at a 5% cap rate. GGP reported Q4 adjusted FFO of $0.38, in line with our estimate and consensus. GGP issued 2015 FFO guidance of $1.40-$1.46 (4.5% same0store NOI growth) vs. consensus of $1.44. Same-store sales increased 4.8% in 4Q and 1% for the trailing 12 months to $570 per square foot. Sales growth should improve in 2015, in our view, given the strengthening economy, lower gas prices, and weak comps. Total tenant sales, which could be a better indicator of portfolio health, increased 5.4% in 4Q and 2.8% for the trailing 12 months. Total sales include the larger format fast-fashion retailers that are taking market share from traditional retailers. Core portfolio fundamentals were strong, in our view. Same store occupancy increased 10 basis points year over year to 97.2%. Occupancy could dip in early 2015 due to increased store closure and re-tenant activity. However, retailer demand is robust for high quality mall space and we expect GGP to backfill any closures relatively quickly with better retailers at higher rents. We think GGP will increase occupancy in 2015 with the occupancy gains weighted toward 2H’15. Kimco Realty Corporation (KIM) reported Q4’14 FFO/share of $0.35, in line with our and the consensus estimate. The strong operating results were driven by leasing spreads and occupancy gains. The company introduced its 2015 FFO guide of $1.40–$1.44, which assumes same store net operating income (SSNOI) grows 3.25%. The guidance, $0.04 below [our estimate], reflects a $0.02 foreign-exchange hit, slightly lower SSNOI growth and a less favorable mix of external activity. Management introduced its 2015 FFO guidance range of $1.40-$1.44, which excludes $0.07 of transactional income and includes $0.02 of negative currency impact. The guide also assumes SSNOI grows in the range of 3.0-3.5% with U.S. occupancy gains of 25-50 basis points. We expect the impact of store closures to be relatively small. In Q4, SSNOI grew 3.1% (4.0% when excluding the impact of currency), and U.S. SSNOI grew 4.3%. For the full-year 2014, SSNOI grew 3.3% (excluding currency). Leasing spreads were a healthy 9.4%, and same-center occupancy increased 80 basis points to 95.6%. 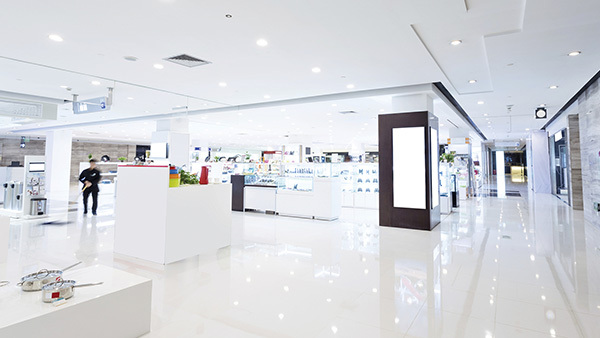 Notably, small-shop occupancy increased 280 basis points to 88%. Combined occupancy was 95.8%, representing the highest occupancy levels in Kimco’s portfolio since 2008. Besides the $0.02 forex impact, the 2015 guidance provides for slightly lower SSNOI growth and a less favorable external activity mix than our model. In 4Q Kimco acquired an interest in nine shopping centers for $245 million … and sold $697 million … of assets. In January, Kimco announced that it acquired the remaining 66.67% interest in the 39-property Kimstone portfolio for $925 million, which includes the assumption of $426.7 million of debt. In Q4, Kimco substantially completed its exit from Latin America by selling 25 properties for $205 million. The 2015 guidance assumes acquisitions in the range of $1.2 billion (vs. our $975 million) and dispositions of $650 million (vs. our $600 million). As of the end of the quarter Kimco’s redevelopment pipeline included 64 projects for a total cost of $303.8 million. The yields on these projects are in the range of 8.5-16.5%. All of these projects are expected to be completed by the end of 2016. KIM’s portfolio is performing well and strong growth should continue. KIM is increasing occupancy and pushing rents in the favorable supply/demand environment. KIM has significantly grown its redevelopment pipeline to take advantage of the strong retailer demand and the projects are beginning to contribute more to same store growth. KIM completed its exit of Latin America in 2014 and is having success sourcing acquisition opportunities from its joint ventures, executing on its goal to simplify its business model by reducing the number of joint ventures in its portfolio. KIM reported normalized Q4 FFO of $0.35, in line with our estimate and consensus. KIM provided 2015 FFO guidance of $1.45-$1.53 and adjusted FFO guidance (excludes transactional income) of $1.40-$1.44, below consensus of $1.46. Tenant moveouts have been at multi-year lows over the last few years. Even if moveouts tick up in 2015 (due to M&A or bankruptcies), with limited new retail development and healthy retailer demand, KIM should be able to re-tenant store closures (at higher rents) relatively quickly, in our view. KIM is developing a Whole Foods-anchored, 45,000-square-foot development in Wynnewood, Pennsylvania. KIM acquired a former Sears distribution and surplus retail outlet in Christiana, Delaware, that the REIT plans to develop into a new 440,000-square-foot power center. KIM acquired 90 acres in Houston for future development of a 350,000-square-foot grocery-anchored power center. We would rather KIM option land while working on pre-leasing, but it likely wasn’t possible in these cases. We expect KIM to proceed prudently on any large new developments. LTC Properties’ (LTC) management fine-tuned its per share FFO guidance for 2014 at $2.56 a share plus or minus a penny, with the relative lack of recent investments as a driver there. We are lowering our estimate to $2.56 a share. Our 2015 estimate remains at $2.83 a share. Management has locked in some very attractive debt and raised capital at a highly opportune time, leaving the company in an excellent position to take advantage of acquisitions as they come along. Management spent time [on a call with equity analysts] talking about the company’s position in the industry in light of all of the recent acquisition activity. They believe they can go it alone despite the premium values being paid in acquisitions. They believe the combination of higher yielding development activity and smaller, higher yielding acquisitions can provide value for shareholders, something we also believe. However, we do see LTC as a potential target in such an environment. We continue to really like LTC’s advantages over its larger peers due to the fundamental ability of small targeted higher-yield transactions and developments to really impact the bottom line of the company. These are transactions where there is much less competition, as they barely move the needle for the larger companies. Operating statistics on the company’s portfolio remain solid, with trailing occupancy on its assisted-living facilities (ALF) portfolio sitting at 89.5%, excluding Extendicare, and 79.9% for its skilled-nursing facilities (SNF) portfolio. Coverage ratios are also surprisingly strong, with ratios of 1.7 times before management fees (excluding Extendicare) for its ALF portfolio, and 2.9 times for its SNF portfolio. The coverage ratio for the SNF portfolio is especially encouraging in light of the sequester cuts, and indicates that there should be minimal problems with LTC’s tenants in adjusting to these cuts. On the acquisition front, the company has $108 million in potential acquisitions under letter of intent. It expects one to close in Q4 amounting to about $10 million. It anticipates the remainder to close in Q1 and that this should offset much of the dilution from the Extendicare asset sales. Management noted that it had a solid pipeline for future acquisitions, with approximately $800 million currently being looked at. On acquisition pricing, pricing for ALFs offers cash yields in the 6.75-7.0% area, while for skilled nursing facilities cash yields range from 8-9%. National Retail Properties (NNN) holds ownership interests in 2,038 commercial properties totaling roughly 22.1 million square feet. The portfolio is spread across 47 different states and is leased to over 350 national and regional retail tenants. Portfolio occupancy is 98.8%, and the weighted average remaining lease term across the NNN portfolio was roughly 12 years. The vast majority of the properties owned by NNN are leased to tenants using a common lease structure for single-tenant properties called a triple-net lease, which requires the tenant to directly pay property taxes, insurance and maintenance expenses on the property. We view this lease structure as a favorable one from the landlord perspective as it generally protects the landlord (in this case NNN) from increases in operating expenses, while also providing modest annual rental rate growth. However, built-in rental rate escalators provide relatively low protection in periods of higher inflation and interest rates. In terms of its geographic diversification, we view the NNN portfolio as well diversified. Properties in NNN’s top two states (Texas and Florida) comprise 30.5% of annual base rental income, but NNN has properties located in 45 other states as well. In terms of tenant diversification, NNN leases its properties to over 350 tenants operating across a number of different business lines. The largest concentrations from a business perspective include convenience stores (18.8% of annual base rent), restaurants (including full and limited service, 15.7% of annual base rent), automotive parts and service (12.0% of annual base rent), and movie theaters (4.7%). With respect to specific tenant concentrations, we view NNN’s portfolio as reasonably diversified, as the company’s top 10 tenants account for roughly 39% of annual base rent. Energy Transfer Partners (Sunoco) accounts for 6.6% of annual base rent. The other tenants that comprise NNN’s top 10 include Mister Car Wash, Pantry, LA Fitness, 7-Eleven, SunTrust, AMC Theatres, Camping World, Chuck E. Cheese, and BJ’s Wholesale Club. NNN reported Q4’14 FFO of $0.56, $0.03 above our estimate and the Street. Recurring FFO was $0.55 per share. Variance to our estimate was higher income ($0.01), lower expenses ($0.01), and tax benefit ($0.01). NNN maintained its 2015 FFO guidance of $2.13-$2.17 and adjusted FFO guidance of $2.19-$2.23. This includes $300 million to $400 million of acquisitions. The guidance midpoint implies 3.4% FFO growth this year. However, initial 2014 FFO guidance implied 4.0% growth while actual 2014 recurring FFO growth was 7.8%. We wouldn’t be surprised to see FFO/adjusted FFO guidance raised throughout the year, as well as acquisition guidance. The portfolio is performing well, in our view; occupancy is a healthy 98.6%, down 20 basis points quarter over quarter and up 40 basis points year over year. This is the 12th consecutive year of occupancy above 96.0%. Only 29 properties are vacant. 12.8% of leases expire through 2018. Top ten tenant concentration decreased to 38.6%, down from 39.3%. Last year marked the 25th consecutive year that NNN increased its dividend. The $0.42 quarterly dividend represents a current yield of 4.15% and a 74.3% 2015 estimated funds-available-for-distribution payout. We expect the company to increase its dividend again this year. The company has $10.6 million of cash and full capacity on its $650 million line of credit. NNN continues to run one of the more conservative balance sheets in the REIT sector. We are raising our 2015 estimated FFO to $2.21 (from $2.19) and our 2016 estimated FFO to $2.37 (from $2.32) to reflect the quarter, lower operating expenses and lower interest costs. Earnings quality and consistency [are] not adequately reflected in current valuation. Post the REIT’s Q3’14 results, we continue to view W. P. Carey Inc. (WPC) as an underappreciated story relative to its large-cap single-tenant net lease (STNL) peers … We reiterate our Buy rating. Improved disclosure, less financial complexity, and increased REIT-level transactions should drive multiple expansion. With the REIT’s improved financial disclosure, its less complicated income statement, and investors’ growing understanding of the non-traded REIT business model, we believe WPC’s complexity discount should continue to fade, thereby providing the REIT with a more attractive cost of capital to chase REIT-level acquisitions. This growing appetite for on-balance sheet acquisitions should be a driver of multiple expansion as WPC starts to derive increasingly less adjusted FFO per share from its Investment Management (IM) unit, which is a lower multiple and less predictable business in our view. At the same token, the quality of the cash flow coming from the IM business is also improving, as a greater portion of its IM EBITDA should come from assets-under-management (AUM) fees and its 10% general partnership (GP) interest in the funds versus one time-ish structuring fees. We believe all of these positive developments should drive further multiple expansion for WPC vs. its large-cap single-tenant peers. As of Sept. 30, 2014, W. P. Carey owned four operating properties and 688 net lease properties totaling 80.8 million square feet that are leased to 215 different tenants. The portfolio was 98.1% occupied at Q3’14-end, which was a 40 basis points sequential decrease versus Q2’14 and a 90 basis points decrease versus Q3’13. In Q3’14, W. P. Carey acquired two assets for its wholly owned portfolio at a combined price of $163.3 million. These assets consisted of a 275,725-square-foot office property located in Stavanger, Norway leased to Total E&P Norge, and a 250,813-square-feet office property in Westborough, Mass., leased to Bose Corp. W. P. Carey also sold one property in Q3’14, for total proceeds of $370,000. [It] structured $122.8 million of investments for its managed REITs. At the close of Q3’14, WPC’s managed REITs had total assets under management of $8.3 billion. On the acquisitions front, WPC structured $12.5 million of new investments for CPA:17, $110.3 million for CPA:18, and $0.0 million for Carey Watermark Investors (CWI). On the capital raising front, CPA:18 announced $55.6 million of capital raising in Q3’14, while CWI raised $103.1 million during the quarter.